Greetings to Citizens and Friends of the East Kingdom! Hospitality is the heart of East Kingdom Royal — we welcome guests and offer them respite and refreshment as they visit. Such a simple service, and yet so very valuable. One of the joys of Pennsic is the opportunity to celebrate landmark moments with friends who may not be able to gather at any other time or place. A special setting can make the event more memorable, especially if you don’t have to set up the space! … and other types of celebrations! The Vigil Chapel will be a 10 x 10 space with removable canvas walls and silk painted faux stained glass windows depicting the various peerages. Furnishings include seating, side tables, and two tables for vigil food or display, with additional ambiance from hanging lanterns and candles. The Chapel will be available between the hours of 10 a.m. and 10 p.m., from Wednesday, August 1st through Thursday, August 9th. The Vigil Chapel must be reserved in advance. For details about reserving the Vigil Chapel, including the possibility of using the State Kitchen to prepare food for your gathering, please email Baroness Medhbh inghean Ui Cheallaigh, Pennsic Major-Domo for Brennan III and Caoilfhionn III. We look forward to your happy occasions! With the permission and support of the Royalty, we are embarking on a grand re-invention of the space at Pennsic reserved for the use of the East Kingdom, commonly called EK Royal. The purpose of EK Royal at Pennsic is not only to be a home for the Royalty to camp in, but an activity hub for the East Kingdom that is beautiful, functional and welcoming. 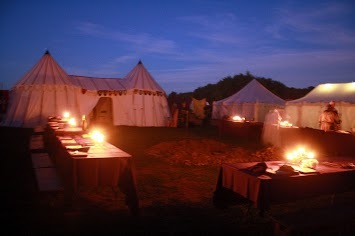 A camp that is bustling with activity – meetings, salons, bardic performances, vigils, dinners and teas – where the subjects and friends of the East feel welcome and valued. Some of these activities are private by necessity, such as Order meetings, commanders’ meetings, and State dinners and some are public, such as classes, performances and casual gatherings. EK Royal is overseen by a team, led by the Pennsic Steward (kingdom officer appointed for a 4 year term) and the Pennsic Major-domo (appointed each year for a single Pennsic). The Steward is responsible for Land Grab, for providing the infrastructure and facilities in EK Royal, for maintaining all Pennsic-related EK property and is the interface between EK Royal and Pennsic staff. The Major-domo is responsible for scheduling of all spaces, for hospitality and gate guards, and is the interface with the Royalty.